For those of you who don't read, speak, or understand Spanish, Calabacita means 'little squash.' Based on that ginormous context clue you can assume the dish has something to do with squash. Normally, the recipe calls for as many squash as you want. We traditionally add three medium sized zucchini or yellow squash for 4-6 servings. However, after digging through the veggie crisper we found that we had only 1 zucchini and 2 chayote squash. We picked up the chayote on a whim. I had heard from a Spanish friend of mine that the aforementioned squash was a main staple for the Aztec and comes directly from the Aztec pronounciation, chayotli. The fruit of the plant are light green and pear shaped. Once sliced down the middle, you will see a soft white flesh and one large seed. That seed should not be tossed out with the trash. You can fry it up or eat it raw. In fact, you can eat the whole squash raw like many other squash out there. This all intrigued me, so I decided to get a couple. I'm glad I did. We found some other stuff to work with and this is what we came up with. 2 Chayote squash, halved, seed removed, and cubed 1"
1 Italian squash, cubed 1"
3 Roma tomatoes, cubed, pulps in tact. Optional: Top with sliced avocado, fresh cilantro, lime, and shredded Oaxaca, queso fresco, manchego, mozzerella, your imagination is limitless. Heat 2 tbsp olive oil in a large skillet over medium- high heat. Once hot, add the chicken, cook (turning frequently to prevent scorching) until internal temperature reaches 165 degrees F, then remove from heat. If you don't have an internal meat thermometer, go buy one. If you're too poor, just cut a nugget open. If it's still pink in the middle, keep that sucker in the heat. In a separate crock pot, while the chicken is cooking, heat the remaining oil over medium heat. Once hot, add the sweet potato. Cook for about 4 minutes then add garlic and onion and all squash. Cook all together until the zucchini becomes semi-tender, until there is a little resistance when poked with a fork. Add the remaining ingredients and chicken to crock pot. Allow to simmer until sweet potato is fork tender and the zucchini is tender. Serve immediately. 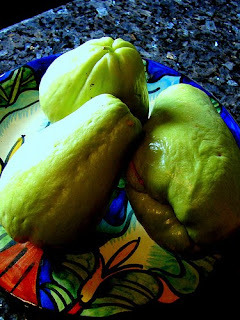 Don't be distraught if your chayote is still firm. Due to the nature of the squash, it will remain a little more firm than other squash. It's supposed to be that way. You can keep this in your fridge for up to a week, but the soft veggies will get a little soggy. It reheats like a champ. So, there it is. I hope you all enjoy this new spin on an old recipe as much as we did. Just don't tell my mother-in-law that her daughter has perfected the art.